The newly launched Patient Charter will impose strict timeframes within which treatment must be provided to patients, according to Health minister Chris Fearne. He said that in cases where these timelines are not met, patients will have a right to seek private healthcare, which the government will pay for. “We are putting our money where our mouth is. Not only are we writing this down in black on white, but we are also making sure that we are held accountable,” said Fearne. 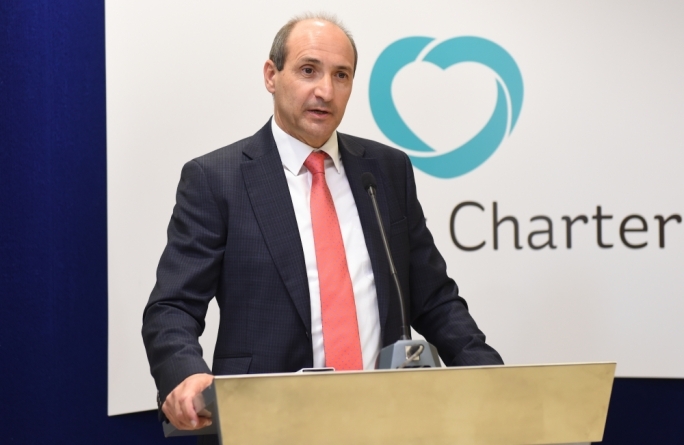 The minister was speaking at Mater Dei Hospital during the launch of the Patient Charter where he said that treatment for non-urgent cases must be started up to 18 months after diagnosis, while all urgent cases must be dealt with within 12 weeks. Fearne said that over the years, the country has developed a very good healthcare system, however a mentality has also developed where the doctor knows everything and the patient has no right to question decisions being taken. “This reality is changing. Information is a lot more accessible nowadays and in some cases you find that certain patients know more than their specialist,” he said. The charter aims to give patients a more active role in the care they receive. It will inform patients of their rights, such as being able to see their file and complete medical records, request or change a consultant, as well as a number of other rights which some people might not know they have. The charter will apply to all departments offering healthcare services, including instances where the government is buying a service from the private sector. It is structured around eight principles that form the foundation for a safe delivery of healthcare namely, health protection, access, information, participation and informed consent, privacy and confidentiality, dignity and respect, safe healthcare and comments and complaints. In addition to the way in which healthcare is provided when someone is ill, Fearne also emphasised the need for preventative care. “We know that a lot of illness is to a large extent preventable and as such, over the coming years we want to see a lot more importance placed on preventative care,” said the minister. In addition to explaining patient’s rights, the charter also outlines responsibilities patients have when receiving healthcare. These include informing the necessary department in cases where a scheduled appointment will be missed, informing healthcare providers of any changes in one’s contact details, not subjecting healthcare workers to abuse and respecting ward policies and procedures. Following the launch, an informal discussion was held in order to clarify specific points in the charter. Asked about whether the charter would be more effective if it were a law the minister said that the charter is an important step but not the last one. He said that the charter represents a big culture change for professionals and that getting used to the new system will take time, and a lot of effort. Given the fact that the change in mentality is a gradual one, the minister said that it did not make sense to turn the charter into law just yet. During the discussion Fearne also addressed claims that cancer patients were having to plead with the Community Chest Fund. He said that this was not the case and more often than not people go to the CCF when they would like experimental drugs that are not yet registered for use in Malta. He added however that given the frequency with which new cancer drugs are developed, there is a lag between when these drugs hit the market and the point at which they are registered for use in Malta. He said that this was a long-standing problem which the ministry is addressing, adding that the in the budget the government had allocated a significant amount of money for purchasing new cancer drugs. Asked about whether there are plans for better palliative care to be provided, Fearne said that he has health talks with the archbishop to explore the possibility of the government paying for services provided by the church.